Sequel would have expanded upon Dead Space 3’s “Flotilla” section. 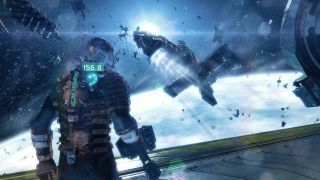 New information has emerged detailing Visceral Games’ aborted plans for what would have been Dead Space 4. Speaking to Eurogamer, former Dead Space creative director Ben Wanat revealed Dead Space 4 would have placed greater emphasis on exploration and scavenging resources for survival, blending the previous games’ tightly scripted action with larger, more open areas that the player could explore freely. "The notion was you were trying to survive day to day against infested ships, searching for a glimmer of life, scavenging supplies to keep your own little ship going, trying to find survivors," said Wanat, who is now creative director at Crystal Dynamics. Dead Space 4 would have expanded upon the “Lost Flotilla” chapter of Dead Space 3, in which Isaac drifted through a graveyard of destroyed spaceships on the trail of an SOS signal. “The flotilla section in Dead Space 3 hinted at what non-linear gameplay could be, and I would have loved to go a lot deeper into that," Wanat said. The article reveals a couple of other interesting details. Dead Space 4 likely wouldn’t have featured Isaac Clarke as the main character. There were no solid plans for who the player would have controlled, but Wanat’s preferred choice of protagonist was Ellie, a side-character featured in Dead Space 3. In addition, Dead Space 4 would have introduced a new range of Necromorphs that were more dangerous in Zero-G environments, and reworked the controversial crafting element of the previous game, “I love that it gave players creativity in putting together their weapons, but it became very difficult to tune when you allowed players to break the primary and alt-fire pairings,” Wanat said. Visceral of course never got the chance to put these ideas into action, having been added to EA’s own studio graveyard late last year. Nonetheless, the revelations form yet another chapter in the series’ fascinating history. Last year, Eurogamer also revealed that Visceral’s original vision for Dead Space 3 was very different from the final product, while PC Gamer contributor Mat Paget learned that the original Dead Space began life as System Shock 3.